Other than meeting cute single cowboys and cowgirls, visiting remote and rural locations has many wonderful benefits. Most of us live in busy and noisy cities, and this particular change of scenery is something we all need from time to time. The majestic landscapes and fresh air are good for our body and overall health. So, if you’re planning a road trip anytime soon, make sure to check out these 5 breathtaking countryside locations in the United States. Throughout the history of the United States of America, plantations were associated with negative things such as slavery and harsh manual labor. However, we now live in different times when all people can visit these beautiful places and enjoy the scenery. 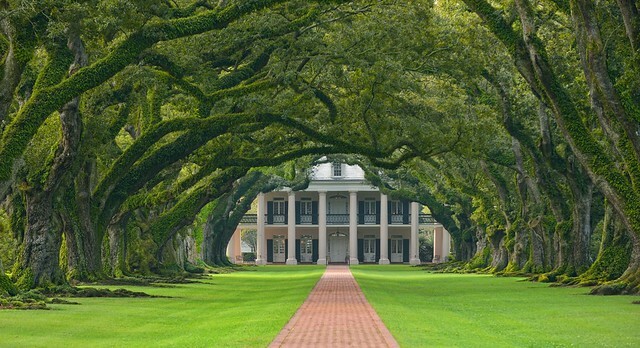 This is why Oak Alley Plantation is one of the rural places you simply have to visit in Louisiana. It features a number of beautiful old houses, one of which is the legendary Greek Revival plantation house. If this manor looks familiar to you, that’s because it was featured in the famous movie called “Interview with the Vampire”. Besides the main house, this plantation is a home to many lovely 300-year-old oak trees that will take your breath away. This beautiful and isolated valley located in the Tennessee section of the Great Smoky Mountains National Park is something you have to see, at least once in your life. Back in the day, the valley was home to many settlers. However, after the formation of the national park, some of them scattered away and left the area. As we said, Cades Cove is a very remote and isolated area, but that doesn’t mean tourists don’t know about it. So, if you want to have a peaceful hike, make sure to visit this place in the off-season. If you want to see some of the most majestic sceneries and landscapes in the entire United States, you should definitely visit Skagit Valley in Washington. This valley is a home to many breathtaking tulip fields in the world. So, if you’re into colorful flowers, fresh air, and peace, this remote valley near Washington is the perfect choice for your next road trip. As you probably know, Vermont is a home to many covered bridges and similar historical monuments. Some people say that there are over 100 covered bridges in this area, but all historians and architects claim that Arlington Green Covered Bridge is probably the oldest and best-preserved covered bridge in entire Vermont. So, if you’re a history buff and you want to enjoy some mesmerizing sceneries, we advise you to visit Vermont this autumn, you won’t regret it. The entire Natchez Trace Parkway is rather stunning, but the legendary boardwalk trail through the Cypress Swamp is something you definitely have to experience at least once. The combination of swamp and tall trees is something you don’t see very often, but Tupelo and bald Cypress trees thrive in these watery conditions. Hiking through the Cypress Swamp is like being in a fairytale.